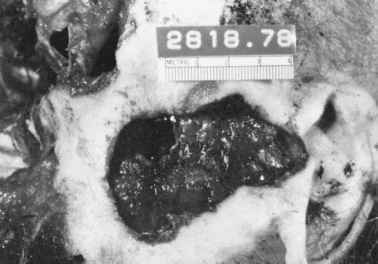 Figure 12.4 Intermediate-range gunshot wound of chest from .22 Magnum revolver. Note the absence of powder on the outside of the clothing with powder tattooing of the underlying skin. by another, different conclusions may be reached as to the range from which the individual was shot. In view of these facts, one can see why examination of the clothing is part of the autopsy. This examination should be conducted not only with the naked eye but with the dissecting microscope. The presence of one or two grains of powder on clothing does not necessarily mean that the deceased was shot at close range. Powder grains can travel as far as 20 ft from muzzle to clothing. In addition to aiding in range determination, clothing may give an idea as to the position of the deceased at the time they were shot by correlating the holes in the clothing with the entrance and exit wounds in the body. Just as the powder gases produce alterations in the wounds on the body, so will they alter the appearance of bullet holes in the clothing. In contact wounds through clothing, depending on the type of fabric and the amount of gas produced, tearing and/or melting of the material can occur. This is true whether the garment is hanging loose or pulled tightly against the skin. Contact wounds in cloth composed of cotton or a cotton mixture with medium and large-caliber weapons (.38 Special and above), usually result in tears with a cruciform appearance (Figure 12.5). Contact wounds in 100% synthetic material (nylon, triacetate, etc.) result not in tears but in "burn holes." The heat of the gases causes the material to melt producing large circular holes, usually with scalloped margins (Figure 12.5). Figure 12.5 (a) Contact wound through 100% synthetic material; (b) stellate-shaped defect through 100% cotton material. dimensions) cruciform tear in the material. Similar shots with 100% synthetic materials resulted in roughly circular holes 4 to 5.5 cm in diameter whose edges were scalloped. With large- and medium-caliber weapons, tears in material may occur not only at contact range but at near-contact range. Thus, tests with the aforementioned weapon using 158-gr. roundnose ammunition resulted in tears of the cloth occurring with shots up to 0.5 cm from muzzle to target. Ammunition that produces a small amount of gas, such as the .22 rimfire cartridge, tends to produce either a single tear or an incomplete cruciform tear in cotton material. In synthetics .22 Long Rifle ammunition produces burn holes averaging 10 mm in diameter. Some of the older forensic literature mentions that clothing can be ignited by close-range firing. This refers to black powder cartridges, however. Black powder emerging from the barrel is often still burning. It can land on clothing, continue to burn, and ignite the clothing. This does not occur with smokeless powder. Occasionally, a pillow is used to muffle a gunshot. If the weapon is a revolver, in addition to a blackened seared entrance hole, one can see a linear, an "L" or a "V" shaped blackened zone of seared material on the pillow where it was wrapped around the cylinder of the gun (see Figure 4.10). This mark is due to soot and hot gases that have escaped from the cylinder gap of the gun. Measurement of the distance between this mark and the entrance hole will give one an idea of the barrel length of the weapon (see Figure 4.11). If 100% synthetic material overlaps the cylinder gap, the gases may burn completely through the material. "Bullet wipe" is a gray to black rim around an entrance hole in clothing. It is seen around holes made by both lead and full metal-jacketed bullets. It is not, as some people contend, lead wiped off the bullet but is principally soot. Lubricant and small amounts of metallic elements from the primer, cartridge case, and bullet may also be present in the bullet wipe. As a bullet moves down the barrel of a gun, it is coated with soot, lubricant, and the previously mentioned metallic elements. In addition, the bullet may pick up debris left in the barrel by prior discharge of the weapon. Unburnt grains of powder may become adherent to a bullet, especially its base. The bullet carries all this material on itself to the target. As it passes through the clothing, it "wipes off" this material, producing the bullet wipe. If one thoroughly cleans the interior of a barrel until there is no material left in it and then fires a bullet down the barrel, this bullet on striking cloth will produce a light gray sometimes almost imperceptible bullet wipe. As more and more rounds of ammunition are discharged down the barrel, the bullet wipes produced will become increasingly darker in color until finally the color will stabilize as a dark black. If a bullet goes through multiple layers of cloth, bullet wipe may be present only around the defect in the cloth that was perforated first. 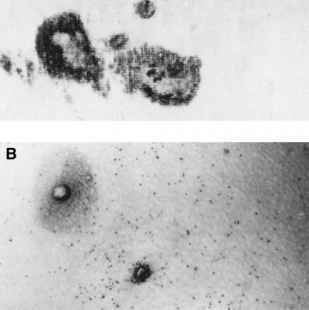 Bullet wipe is seen in microscopic sections of entrance wounds as small particulate deposits of amorphous black material along the wound path. It is often mistakenly interpreted as "powder" and erroneously construed as evidence of a close range wound. Careful examination of both sides of a bullet hole in clothing, using a dissecting microscope, may suggest the direction in which the bullet was moving by which way the fibers are bent. It should be realized that not all fibers are bent in the direction of the path of the bullet, and in fact some fibers may point in the opposite direction. Deposition of fragments of tissue on the inner surface of clothing around a bullet hole strongly suggests that it is an exit. In the case of wounds due to centerfire rifles, and rarely with handguns, tissue may also be blown out the entrance, and deposited on the inner surface of the cloth around the entrance. This is a result of positive pressure waves generated in the temporary cavity formed by the bullet. The amount of such tissue is significantly less than that deposited adjacent to the exit.